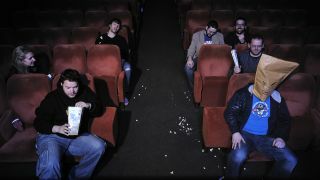 A new method of projecting 3D images on to cinema screens has been trialled, which does away with the need for glasses. Despite many cinemagoers' reservations about the technology, 3D is big business in movies and many a cinema chain is cashing in on the tech, putting up prices for 3D movies and adding another premium on top of this with the purchase of 3D glasses. This could be set to change, however, if Seoul National University has anything to do with it. A new study into 3D by the university has found that glasses-free 3D could work on the big screen and only one projector is needed, rather than multiple projectors as first thought. The technology uses angled slats, in much the same way that 3D works on a handheld like the Nintendo 3DS, but has been modified so that it works from multiple viewpoints. This parallax barrier technology is similar to what is used in the Toshiba ZL2, where lenticular "lenslets" allow multiple viewers to watch the same 3D space. The team at the Seoul National University have apparently managed to modify this for use on cinema screens. The key to making the 3D work is a special coating on the cinema screen that, combined with the adaptive barrier technology, created enough multiple images to theoretically accommodate a cinema. Lead scientist Byoungho Lee said that this method "might constitute a simple, compact, and cost-effective approach to producing widely available 3D cinema, while also eliminating the need for wearing polarising glasses". There's no word on when, or indeed if, this trial will roll out to cinemas but it's good to know there's work being done to rid the world of 3D glasses.